This year’s Kenya Music and Cultural Festival at the Meru TTC in Meru County has proved a tough competition for most participants. 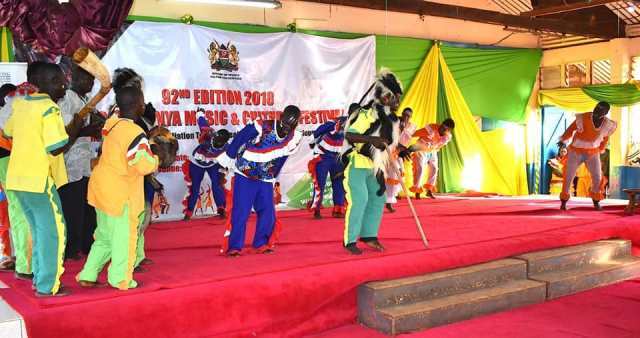 Kakamega County however continues to thrill the audience, treating art lovers with different music joundres intertwined with Luhya cultural body movements and attires. The current table standings show Kakamega leading the pack with only few presentations remaining for the day. Kakamega County is the defending champion. The event comes to an end tomorrow as the public is invited for a gala extravaganza where best teams including Matende Cultural group, Sigalagala National Polytechnic, Masinde Muliro University of Science and Technology among others from Kakamega County, will entertain the guests. Kakamega’s delegation is led by the CECM for Social Services, Culture, Youth and Sports Hon. Robert Makhanu. Also present in a special capacity is Kenya’s Tourism Ambassador of Investment who is also the reigning Miss Tourism Kakamega 2018, Linet Kamadi.